Backup agent uses tcp port to listen to request from Backup manager. This tcp port must be open in your firewall regardless your firewall is software based or hardware based. To change this tcp port, launch Backup Agent Configuration Utility and select "Agent Configuration" tab. 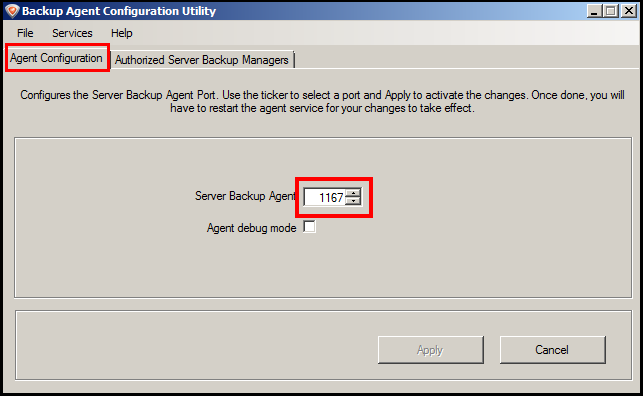 You may change Server Backup Agent port 1167(default) to your choice of tcp port. You may leave Agent debug mode unchecked. Click [APPLY] button to save your changes. You may close this application by clicking on [X] in the upper right corner.